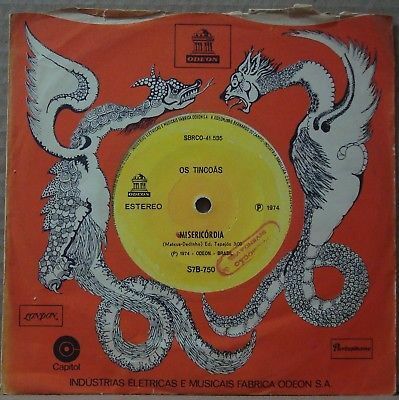 RARE BRAZILIAN 7” INCH RECORD OF THE BRAZILIAN VOCAL TRIO WITH TWO AMAZING AFRO & SAMBA TUNES,”MISERICORDIA” IS ONE (NON- LP) TRACK,MUSICAL ARRANGEMENTS OF JOÃO DONATO! IMPORTANT :The value of shipping for one item (one Single or one Ep record)to United States Of America is U$10.00 via priority registered mail (air-mail),the value of shipping to more items please look the descripition. Please only bid if you agree with the values,I don´t ship the item if the bidder refused to pay the values of I specific on the descripition! When the auction ends,I will e-mail buyer with details of payments and shipping rates according to location. After the customer receives invoice,please inform me the payment method chosen. I'll wait for 5 days to receive payment. THANKS YOU FOR LOOKING MY ITEMS AND HAPPY BIDDING !